South Park: The Fractured But Whole has sentiment. This might be a surprise given the television show's notoriety for crass, irreverent humour. Shock humour can grab an audience's attention, but it can't maintain it, and that's why The Fractured But Whole uses small details to give its bawdy cast of nine-year-olds humanity. It's difficult to convince people who have little experience with the show that South Park is something worth starting. The show often courts controversy as the point, not the means to the end. It delayed a cliffhanger as an April Fool's joke in Season 1. It satirized the controversies over depicting the Islamic prophet Muhammad in Season 14. One of its storylines featured a Virgin Mary statue bleeding from her nether regions. The Fractured But Whole leans into this by having a pimp slap mini-game. 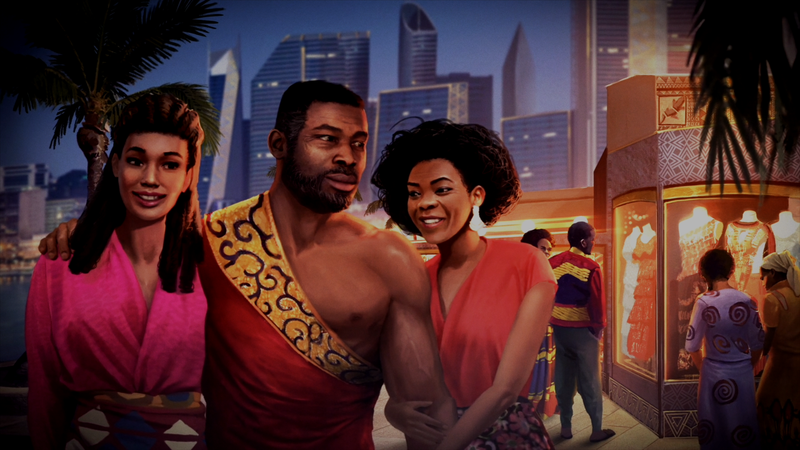 And by using race as a difficulty slider, though its effects seem largely cosmetic; if you play as a black character, Morgan Freeman will give you an afro pick midway through the game (and if you play as a girl, Wendy will give you a friendship bracelet). But the key to the show's longevity is its characters, who, underlying all the mayhem, are sympathetic and well-rendered. The characterization is subtle; you have to watch multiple episodes of the show to pick up on it. But it's there, and it's responsible for the show's loyal following. 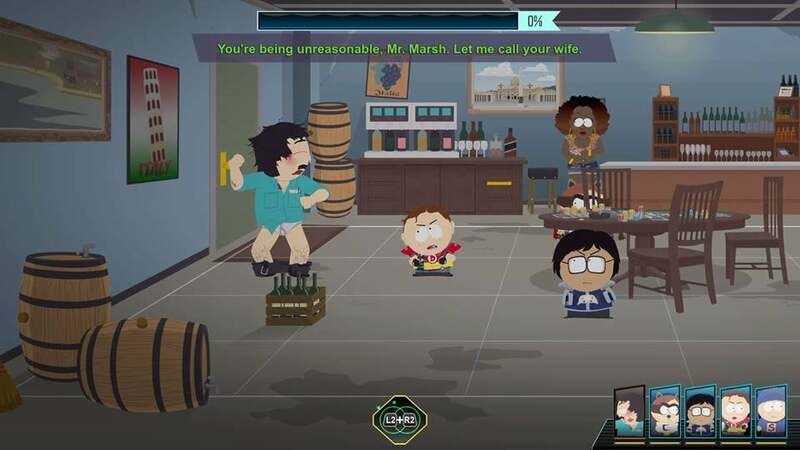 2014's South Park: The Stick of Truth featured an in-game collectible called Chinpokomon, the show's Season 3 send-up of Pokemon. There were 30 Chinpokomon in all, along with a special achievement for finding them. 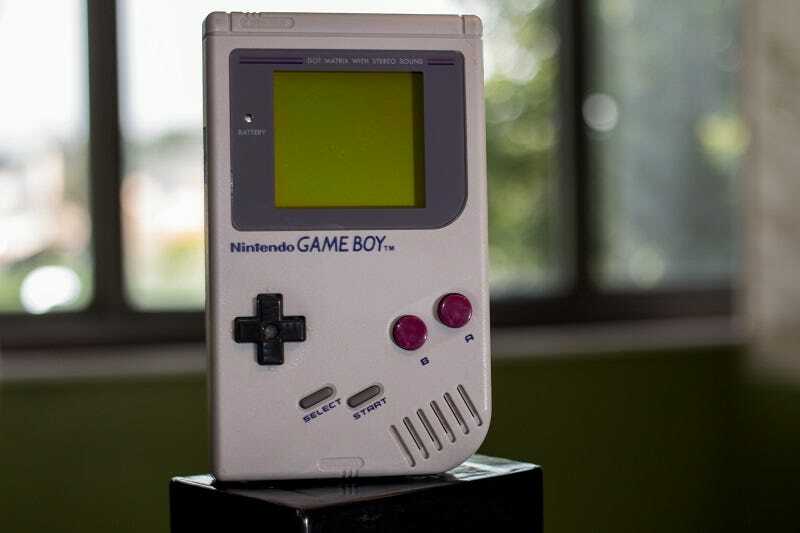 Six of them were missable during the single-player campaign; you couldn't backtrack later to collect them after finishing the game. That meant you had to be vigilant if you were a completionist. 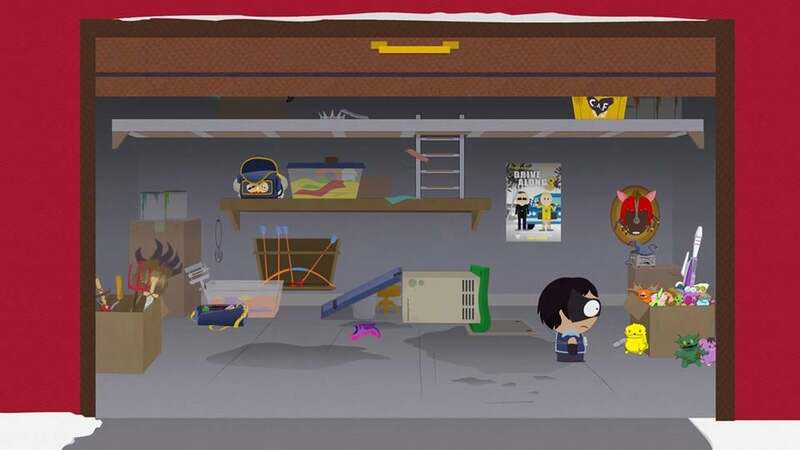 In The Fractured But Whole, player-character The New Kid has a box in his garage full of The Stick of Truth's Chinpokomon. They're stuffed into a single, overflowing cardboard box, collecting dust. It's a strangely affecting meta-commentary on the amount of effort players might have placed into acquiring them in The Stick of Truth. It's almost as if Parker and Stone are saying, "Well, what the hell did you think was going to happen to all that crap?" It's how childhood interests play out: You're really into G.I. Joes until you learn about the Masters of the Universe. You're really into Masters of the Universe until you learn about the Teenage Mutant Ninja Turtles. And that abandoned stuff, which you don't love the way you used to, has to go somewhere. 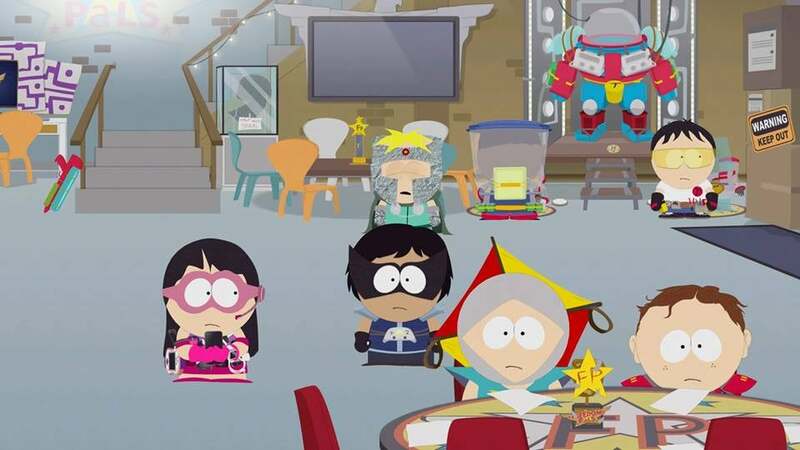 One minute, the South Park kids are playing Orcs and Wizards; the next minute, they're playing superheroes. 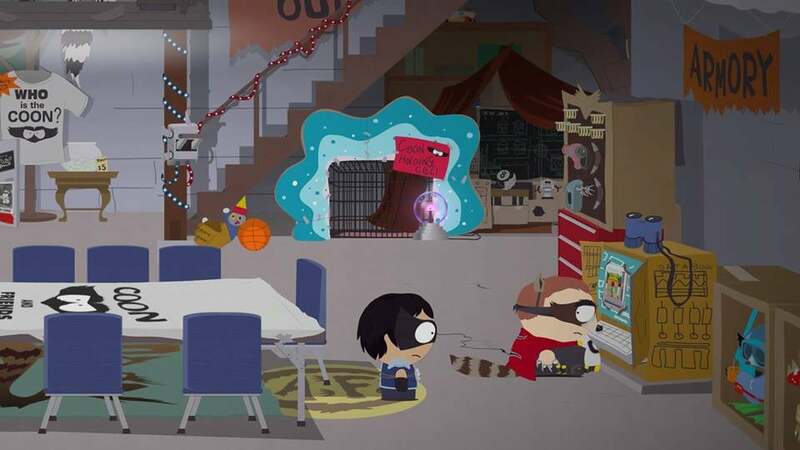 Both The Stick of Truth and The Fractured But Whole celebrate kids' fleeting obsessions and the intensity with which they play pretend. The kids' closets are filled with Easter eggs. 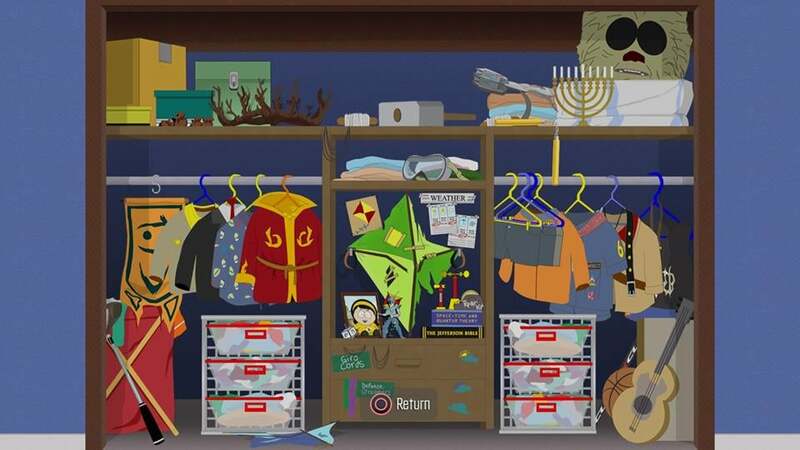 In Kyle's closet in the picture above, you can see his tree branch crown from the Stick of Truth on the top shelf. There's also his "sweet Chewbacca costume" from the show's Season 1 on the right, thoughtfully aged and faded from its original dark brown. He also has a framed picture of Leslie Meyers on the center dresser. She turned out to be the villain of Season 19, but in the aftermath, he apparently took the time to frame her picture. Clearly, he still has feelings for her, even if he doesn't want anyone to know about them. These are Easter eggs for long time fans. But they also establishes a canon to these characters - of the challenges they have taken on and the things that hold sentimental, historical importance. Many of the kids' superhero identities correlate with their real-life problems. 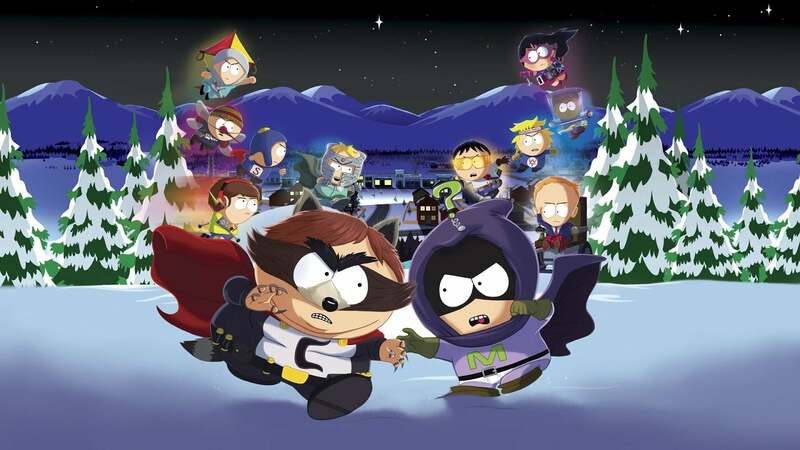 Kenny's "Mysterion" alter ego serves as a guardian angel for his sister on the TV show. In the game, his kryptonite is "Poverty," a reference to Kenny's widely-mocked economic status. Butters' "Professor Chaos," as explained in the TV show, is a rebellious response to his parents, who are extremely strict and punitive. Scott Melkinson is a type 1 diabetic, and so of course, he reframes his condition as a superpower as Captain Diabetes, who can gain super strength through diabetic rage. At this point, you, as The New Kid, have already fought Stan's dad Randy twice. Both times, he's raving drunk (the second time, he's "Red Wine Drunk"). Both times, you fight to keep him from getting his car keys. Stan later states that he owes you a debt for protecting his father. This origin story seems like a way Stan can reframe and rationalize his dad's alcoholism and embarrassing behaviour. It's darkly funny, but it's also sad. For some kids, playing pretend is a fun diversion. But for many kids, like Stan, it's a matter of psychological preservation. Clyde's family is still hurting from his mother's death. Cylde's mum Betsy Donovan died in Season 16 after Clyde left the toilet seat up in their house; after falling in the toilet, she got her internal organs sucked out by the water pressure. The Fractured But Whole has several references to her death. If you go inside Clyde's father's room, you can see there's only one pillow, on the left side of the bed. You later find his father at the local bar trying to pick up women. Late in the game, when Clyde is afraid he's going to die, he creates the following post on Coonstagram (the in-game version of Instagram). "Dad, if you can see this I love you. I'll say hi to mum for you." South Park has an interesting relationship with death. Sometimes it's played completely for laughs, like in the early seasons of the show when Kenny died every week. Other times, like in the Season 5 episode "Kenny Dies," it's played relatively seriously; the audience sees Kenny suffer, and his friends grieve rather than scream their throwaway catchphrases. The death of Clyde's mother, both in the show and in the game, straddles the line between both approaches. There's an inherent crass comedy to how she died, but its effects on Clyde and his family are never mined for laughs. 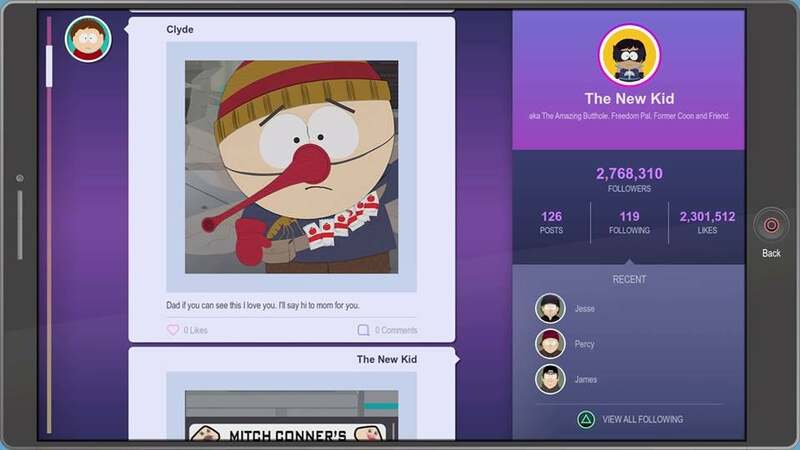 The South Park citizens make a lot of in-jokes about The New Kid's muteness, since he doesn't talk in either The Stick of Truth or The Fractured But Whole. On one level, it's a creative decision on the part of the developers; by not having the character talk, the player is more easily able to project him or herself into the story. But The Fractured But Whole makes an effort to explain the character's muteness. Every time we see his parents, they're yelling and screaming at each other. His mother is usually drunk, and his father is usually high. 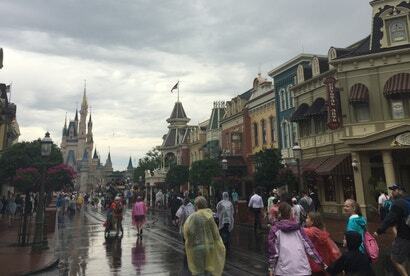 One might assume that The New Kid deals with his pain by disconnecting from people - even his family - and that staying silent is part of that. His isolation is prominent during the dinner scenes at the end of each in-game day. None of these scenes are played for laughs or have any humour in them. The New Kid just sits, sighs, and picks at his food; he eats one bite of what looks like meatloaf and heads to bed. 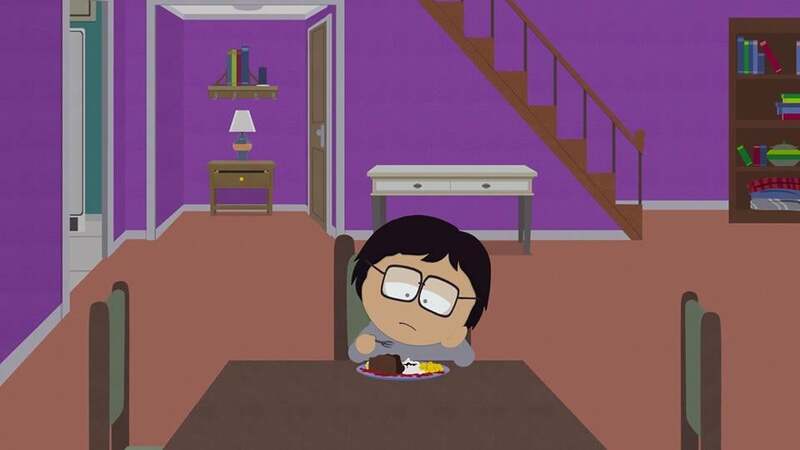 Even though he's spent the entire day hanging out with friends and playing (he even gets Craig and Tweek to resume their romantic relationship), he's emotionally isolated in his own home. 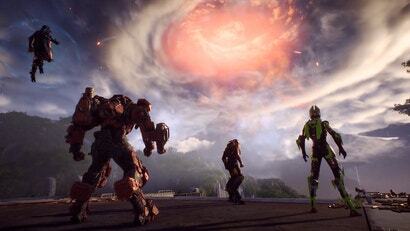 The game focuses heavily on social media and its influence. Several times throughout the game, the New Kid's worth is tied to his ability to make online friends. But a person's online life is largely performative. The New Kid can make over 100 online friends during the game, but he's still fundamentally lonely. After the game's storyline ends, you are put in permanent "Hero on Patrol" mode, which means that you can finish any side quests that you missed and continue exploring the open world. 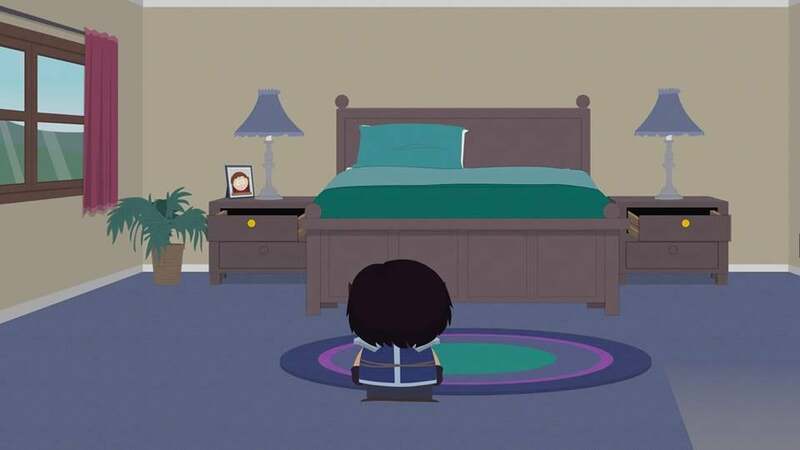 If you go to Token's house, you can see that all the South Park kids are gathered together. They will all take selfies with you (if you haven't already), because they trust you as their friend. Cartman, however, is alone in his basement. If you try talking to him, he won't say more than a handful of words before ignoring you again. If you fight any battles or start any sidequests, he's not selectable as a fighter. And he's the only playable character who never follows you on Coonstagram. Cartman, obviously, needs no sympathy. His ploy to become mayor is the main conflict of the game, and he's legitimately evil in the show. In the show, he's often humiliated or mocked, but he's rarely punished, and he always gets attention. No matter what he does, people still acknowledge him in some way, which is what he craves. On the TV show, the one time everyone decides to ignore Cartman in Season 9's "The Death of Eric Cartman," he becomes convinced that he's dead. Kyle: We just wanna warn you. Eric Cartman, the fourth grader, is going to try and trick you somehow into getting your weiner bitten off by a pony who lives at Denkins' ranch. Kyle: 'Cause we're his friends. Kyle: 'Cause we hate him. But the events of The Fractured But Whole, where Cartman poisons the town and tries to swing the mayoral election, are a step too far. And unlike on the television show, when he thought he was dead, this time Cartman knows he's being shunned. And that's the worst punishment of all. Starting in Seasons 5 and 6 of the show - around the same time that Kenny died for an entire season - Trey Parker and Matt Stone began fleshing out the other kids in Mr. Garrison's class. 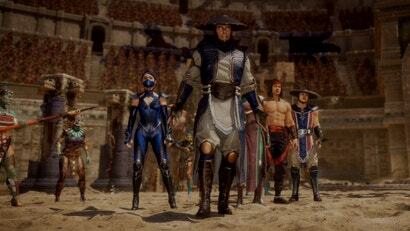 There were less gimmicks and more characterization. Butters, Clyde, Craig, Tweek, Token, Kenny, and Jimmy became secondary players instead of visual dressing for crowd scenes. Many of South Park's characters, despite their numerous flaws, are sympathetic and warm. It's what allows the show to do an extended riff on Kim Kardashian being a hobbit, before closing the episode with Wendy crying while giving in to the peer pressure of Photoshopping her pictures. The Fractured But Whole has similar moments, here and there, that tug on players' heartstrings. We gain attachment to the South Park kids and to our player avatar, The New Kid, through these small, thoughtful touches. And when we care about the characters beyond being joke vehicles, it makes the humour more resonant. Great article, South Park is such an awesome show and both The Stick if Truth and The Fractured But Whole perfectly capture it. Would have to be the funniest game to come a long in a very long time.